SHELBYVILLE, IN�JULY 7, 2018� Tres My Heart was the seventh fastest qualifier of the field, but proved to be the quickest to the wire Saturday (Jul 7) to earn the win in the $50,000 Indiana Grand QHRAI Derby. Ridden by Giovani Vazquez-Gomez, Tres My Heart stopped the timer in :20.020 for the 400-yard dash. Tres My Heart, making only her second career start, had a clean break from the gate and seemed focused from the start. The three-year-old Oklahoma bred daughter of third-crop sire HEART OF THE CARTEL grabbed a short lead and became the horse that the rest of the field would have to catch in the final portions of the race. Several were closing in at the wire, but Tres My Heart held her ground, winning by a neck over Flight To La Jolla and Shanley Jackson. BS Special, ridden by Berkley Packer, rounded out the top three finishers. "I had faith in her," said Vazquez-Gomez through his wife, Jessica, who served as the interpreter. "She had many mistakes in her first start. She started in post three last time and ended up moving down and running in the one path. I saw that she had more in her that night. I'm not surprised she won." A surprise to the betting public, Tres My Heart paid $20.00, $7.60 and $2.80 across the board. She broke her maiden in the stakes race for her owner Maria Stephany Chaparro and her trainer Hector Sanchez. "She had a lot of complications in her first start," said Sanchez. "I knew she had potential to do something. I told Giovani she had the class, she can go the distance and she had the potential. She showed that tonight." Canadian River QH LLC bred Trey My Heart from the Tres Sies mare Famous Mariah. Sanchez earned his second career stakes win, adding the Indiana Grand QHRAI Derby to a previous stakes win he earned at Los Alamitos. 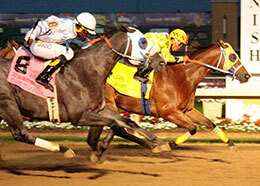 The win with Tres My Heart was the biggest and first stakes win for Vazquez-Gomez.